What is this Earthling’s Handbook, anyway? Ohh, look at the rushing river! That’s what Nicholas said on Saturday as we were walking up the main street of our neighborhood. After a moment’s puzzlement, I realized he was talking about the gutter full of melted snow! Speeding downhill, running between a bank of tire-scrunched snow clods on one side and the curb on the other, criss-crossing itself in lovely diamond patterns, it was indeed a rushing river. I remembered, for the first time in years, the drainage ditches that ran alongside all the streets in my neighborhood when I was a little kid. (Then the streets were repaved in a more modern style, with curbs and drains, and the ditches were filled in.) They didn’t rush much, due to the slight slopes, but after a thunderstorm they did resemble rivers and often inspired me to imagine what it would be like if the streets were rivers, each block was an island, and my bicycle was a pedal-boat. One ditch didn’t drain completely except during the long dry spell of summer. Most of the year, it was a pond, with several distinct gradations of decreasing grassiness and increasing sliminess down its sides. Tadpoles lived there. It was just a puddle between street and lawn; it was their whole world. Crouching at the edge of this pond on a hot day, I could feel coolness rise from it when the breeze blew toward me. I once watched my brother fall from his Big Wheel into the pond and felt surprised when he didn’t disappear below the surface; it seemed much deeper than its few inches. Another ditch, near my dancing school, was eroded around tree roots, creating cliffs and caves that would have been delightful to explore if you were three inches tall. One springtime, it was lush with moss and tiny wildflowers. I would take an hour to walk four blocks home from dance class because I couldn’t resist exploring each part of this river with my eyes, sending my tiny self on a long and beautiful journey with many places to stop and admire the view. One day I went over there with a friend and some small dolls, but although they had a lovely picnic, it somehow wasn’t as much fun to use “real” little people. The area’s major stormwater drains remained after the street renovation. Most of these were utilitarian concrete culverts that, when dry, provided an uninteresting sunken-knee-deep sidewalk through the middle of a block, and, during a thunderstorm, offered a wading experience that was likely to yank you off your feet, scrape off all your skin, and maybe give you a concussion. There was one place, though, where the water ran out of a pipe under the street and into a place that looked just like a creek: It was all dirt, plants, and mostly-natural rocks. I spent many hours playing there when the water was medium-low, moving rocks and studying the way that changed the water flow. It was a haven away from the orderly shoebox-like houses on their plots of crew-cut lawn, the station wagons and chugging air-conditioners and rarely-visible people. Just by stepping off the street and swinging my legs down over a concrete wall, I could drop into a pocket of wilderness. I often hear parents exclaim over how having children has drawn their attention to things they never noticed before, how they marched through their daily lives blind to the beautiful and fascinating details of the world. I’ve never lost that childhood ability to notice little things and imagine around them. A hike, whether in the wilderness or along city streets, is a series of discoveries for me. But having a new person in my life, a person who sees from a different height and interprets from a different perspective, brings to my attention many things that I was overlooking and renews my appreciation for things I was taking for granted. One day last spring, Nicholas spent a few minutes looking down through a grate at water pouring from several pipes into a larger drain, and then he looked around at the surrounding buildings and exclaimed, “Mama, the people in those buildings are using their sinks!” I don’t know that that really was the source of that particular water, but it reminded me that the city’s many sinks do drain into an elaborate and carefully designed network of pipes that is normally out of sight and out of mind. We have running water right there in our homes and buildings, summoned at whim, and we rarely think about what a miracle it is and how many people’s care and concern went into making it happen. Uggh, the snow is melting, and the whole world is slopped with dirty gray slush. But look at the rushing river! Nicholas saw it and brought me back through whole worlds I thought I had forgotten. It's a wonderful planet but very complicated. 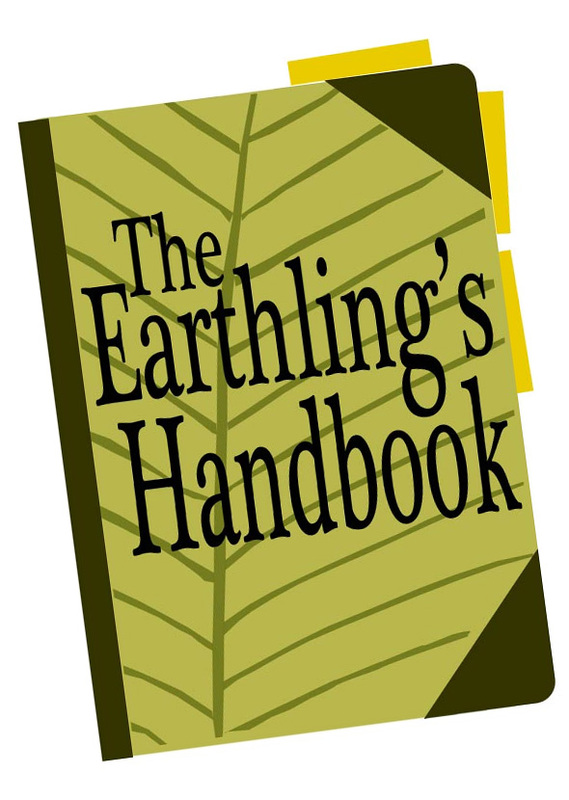 The Earthling's Handbook is here to help you find the fun things to do, good things to eat, and ways to use Earth's plentiful resources wisely; learn about Earth culture, logic, and home management; and maybe even raise a child on Earth. We hope you will enjoy exploring the hundreds of articles here! Get email when a new article is published! Do metal detectors prevent school shootings? Help Save Pittsburgh from Instant Garbage! Go Green in 2019: Cut Back on Single-Use Plastic!